Evolution, Explanation, Ethics and Aesthetics: Towards a Philosophy of Biology focuses on the dominant biological topic of evolution. It deals with the prevailing philosophical themes of how to explain the adaptation of organisms, the interplay of chance and necessity, and the recurrent topics of emergence, reductionism, and progress. In addition, the extensively treated topic of how to explain human nature as a result of natural processes and the encompassed issues of the foundations of morality and the brain-to-mind transformation is discussed. The philosophy of biology is a rapidly expanding field, not more than half a century old at most, and to a large extent is replacing the interest in the philosophy of physics that prevailed in the first two-thirds of the twentieth century. Few texts available have the benefit of being written by an eminent biologist who happens to be also a philosopher, as in this work. 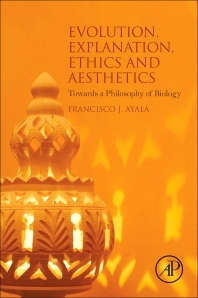 This book is a useful resource for seminar courses and college courses on the philosophy of biology. Researchers, academics, and students in evolutionary biology, behavior, genetics, and biodiversity will also be interested in this work, as will those in human biology and issues such as ethics, religion, and the human mind, along with professional philosophers of science and those concerned with such issues as whether evolution is compatible with religion and/or where morality comes from. Biologists, evolutionary biologists, developmental biologists, and researchers in genetics, medicine, paleontology, ethology, anthropology, psychology, and sociology, as well as students and academics in these areas. Chapter 11. Microevolution and Macroevolution: A New Evolutionary Synthesis? useful especially for scientists, students of evolutionary biology, population genetics and biology in general.